Updated World War 2 Unit Plan! I just gave my World War 2 Unit Plan Bundle a big update and it now includes over 50 activities for teaching everything about WW2 for either World or US History! 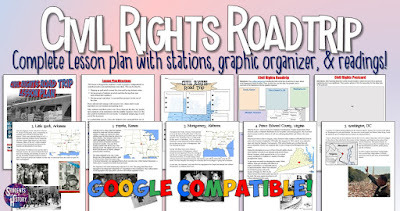 This awesome package features interactive notebook pages, Google Drive, PowerPoints, projects, dozens of primary and secondary source readings and activities, review materials, assessments, and more. These are truly some amazing teaching resources and I know they will be awesome for your classes. I have used them myself for years now and refined them and added to the unit each year. Now, there's so many activities that you have choices each day about which resource you want to use. For example, on day 2 of the unit, there are 3 different reading activities. You can select one for your whole class or have students do different ones in groups! It truly makes for an incredible and interactive unit in your social studies class. You can preview the entire unit here. It includes a Unit Planning Guide plus review materials at the end, including Jeopardy, task cards, and more. Then there's multiple tests to pick from which you can edit as well! I promise this will be one of your best units of the whole year - packed full of exciting and egaging activities! You can download this awesome World War 2 unit plan here! This fantastic Civil Rights Movement lesson plan is inspired by the "Freedom Riders" who took buses South to register voters during the late 1960's. The assassination of Martin Luther King, Jr. These readings can be hung around the room for your students to move through as a station activity, or completed in groups. As students stop and read about each event, they complete a graphic organizer and map each event. This is a great activity to get students moving around the room or used for student presentations. A completed example is included as well as several additional ideas on how to present the lesson. This download includes both printable and Google Drive versions of the activity! If you're in a paperless classroom or just want to integrate more digital resources, you can use the provided link to bring this resource into Google Classroom! 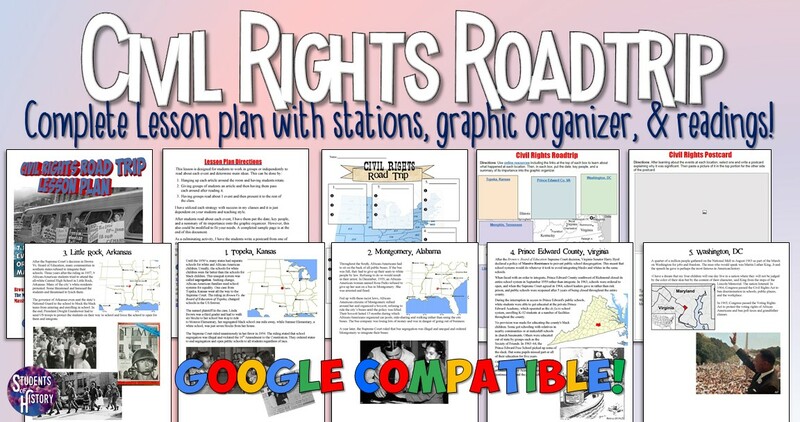 If you need more great resources for this unit, this activity can also be downloaded as part of the larger Civil Rights Movement Resource Bundle which includes many additional resources for your unit! One of the most important lessons in US History is the Watergate Scandal and how it transitions us from the Cold War to Modern America. Today's distrust of politicians and disillusionment in our government really stems from this period. To teach my US History classes about Richard Nixon and the Watergate Scandal, I use this engaging lesson plan. This great activity that you can download here, includes a PowerPoint overview with guided notes plus a primary source analysis activity! The PowerPoint starts off with a bell-ringer activity then covers Nixon's presidency from his election in 1968 to his resignation in 1974. It guides students through the complex Watergate scandal with simple, easy-to-follow notes on the key players, developments, and events of the Watergate Scandal. Next, students analyze a primary source from the scandal. Included are images of the source along with a transcription, worksheet, and timeline of the events of the scandal. A teacher directions page features links to videos plus steps on how to use each resource. Finally, your download includes both printable and Google Docs versions of the primary source analysis activity! If you've gone paperless or want to integrate more digital resources, there's a link to bring this resource into Google Classroom! This is an excellent lesson plan to help students understand the transition to the modern presidency and distrust of politicians. You can download it all for your classes here! Space Race Readings, Timeline, & Newspaper Activity - Now Updated with Google Classroom! 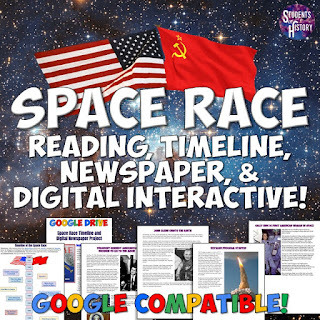 This lesson plan on the Cold War's Space Race has been totally updated to now include a Google Classroom version! The lesson includes 11 1-page articles which students can read to learn about key events in the space race. Students use these to create newspaper pages which they can then present and use to create a human timeline and interactive notebook page timeline! The events include: Sputnik, the famous Soviet dog Laika , voyages of John Glenn, Yuri Gagarin, Neil Armstrong, Voyager, launching of the Hubble Telescope, & more! This can be differentiated in your classes by having students work in pairs, groups, or individually. The new Google Classroom version features a "drag and drop" timeline of events and links to dozens of online sources for students to read about the events of the Space Race! If you're in a paperless classroom or just want to integrate more digital resources, this is a great digital learning activity for the Cold War! You can download this Space Race Timeline and Activity set here! 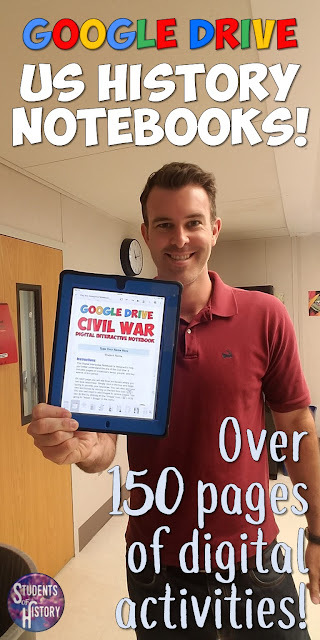 This amazing Complete American History Google Drive Digital Interactive Notebook features 17 sets of fully-editable digital interactive pages on all of American History for Google Drive! There are over 150 pages in this set to cover all of US History through digital pages! This is perfect for 1:1 classes, the computer lab, Chromebooks, or allowing students to use their own devices to learn US History! These pages were based on traditional Interactive Notebook Pages, these these digital Google pages can be completed all online with laptops, tablets, or any other device that supports Google Drive! They also allow for online activities like dragging and dropping timelines, sorting vocabulary, inserting pictures, and other engaging activities! Check out the preview here. These are really excellent for any unit in US History!